The men of the 77th Infantry Division couldn't fathom why Private Desmond T. Doss would venture into the horrors of World War II without a single weapon to defend himself. "You're nothing but a coward!" they said. But the soft-spoken medic insisted that his mission was to heal, not kill. When Desmond knelt by his bunk to pray, his fellow soldiers hurled boots and insults at him. Even his commander wanted to throw him out of the army. But when his unit arrived on the battlefield, the intrepid medic quickly proved he was no coward. One terrifying day in the vicious battle for Okinawa, dozens of Desmond's former tormenters lay wounded and bleeding atop Hacksaw Ridge. As Japanese bullets rained down, their fate seemed hopeless. Could one unarmed man save their lives? This pause-resister will keep you riveted to your seat as you discover how Desmond Doss became the first conscientious objector to receive the Medal of Honor. Desmond's dramatic true story of integrity, redemption, and heroism will inspire you to live by the courage of your convictions. I saw the movie, and decided to purchase the book. I saw the reviews and thought surely the narrator couldn't be that bad. I was wrong. So hard to appreciate the courageous story of this American hero because if the painful reading. It is a good thing the story is compelling and attention grabbing. If it were otherwise I would have bailed after listening to this narrator. It was like listening to a male version of Siri. He can read the words, but often puts the emphasis on the wrong syllable. If I have to hear him say the word “again” again I may have to not finish the last hour of the book. i expected a non-fiction accounting told in a story-like format. it was more of a documentary told in 3rd person. of course. the man was amazing as is his story. my critique is in the production only. 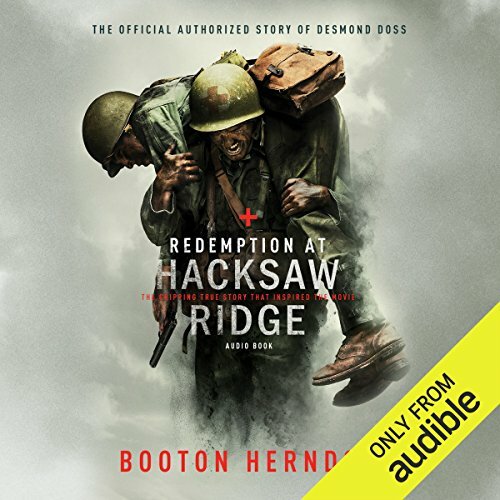 This account of Desmond Doss's life is so compelling that I had to finish listening, despite the narrator's excessively precise pronunciation. glad I read it, but could have been written so much better. This man was a great example of living what you believe. that man was truly an inspiration!! they way he lived his life was a blessing! his story definitely draws me closer to God and He deserves all the glory! Amazing story of an amazing man and the God he revered! The narrator is superb! Well Done! This narration was awesome and it shed light on the importance of Mr. Desmond Doss. This is a wonderful true and inspiring story, I just wish it was read slower, sometimes it moves so fast it's hard to follow.